In Brian May’s own words, with over 300 previously unseen 3-D photographs, this book is a series of glimpses of life with the rock band Queen, seen from the inside for the first time. The pictures and self-penned text tell the story of Brian’s discovery of the world of stereoscopy as a boy, and chronicle Queen from the early 1970s all the way to the present day. The images, from Brian’s personal archives, were taken using the various stereo cameras which Brian carried throughout his life. Viewed in Brian’s patent OWL viewer (included), they leap into stunning three-dimensional realism, giving a uniquely vivid impression of life with Freddie Mercury, Roger Taylor, John Deacon and Brian himself, alongside the people who helped to shape Queen’s amazing global adventure. With these words, the author announces the first book ever to be published about the legendary rock band Queen by a member of the band. And certainly the first book of its kind in the world. 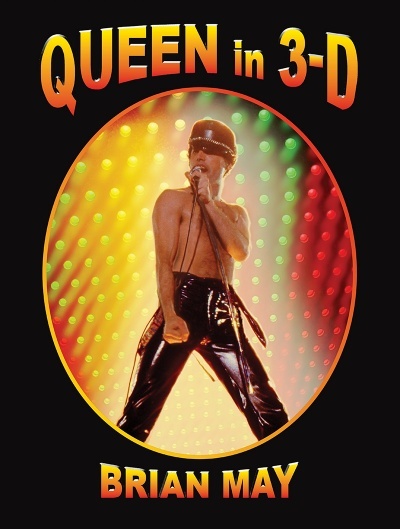 It’s a unique collection of original, highly personal snapshots of Queen in Three Dimensions, from its inception in the early '70s right up to the present day, accompanied by the exclusive recollections of founding member and lead guitarist, Brian May. 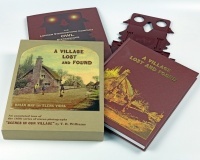 The book is illustrated with over 300 photographs, the majority actually taken by Brian, and mostly in 3-D. These shots of Freddie Mercury, John Deacon, Roger Taylor, and Brian himself, on and off stage all round the world, spring into life when viewed with Brian's patent OWL viewer (supplied free with the book). Through the eyes of Brian’s camera you are transported back in time to experience Queen's miraculous 46-year journey as if you were actually there … whether in a dressing room, in a car, on a plane, or on stage at Madison Square Garden. The three dimensional stereoscopic images (the precursor of Virtual Reality) immerse and engage you in the atmosphere of the moment as no flat 2-D picture ever could. Brian's typically honest account of his experiences within and without the band, including many extreme highs and lows, bravely opens the door to his feelings, beliefs and motivations on this trip though an extraordinary life. This book will entrance millions of Queen fans; but it will also inspire anyone who wonders what they might learn from a man who used his intellect, musical talent, and ability to make the transition from college boy to rock star in just a few years, and then go on building creatively for the next forty! Fortunately, Brian, wielding a stereo camera throughout Queen’s career, was able to capture these previously unseen photographs which provide the triggers for the stories in the book, a collection of gold nuggets for anyone with a fascination for rock music. Physically, this first edition is very special indeed, and highly collectible! Its Brian May-designed, foiled slipcase has a countersunk lenticular image of Freddie on the front, that can be viewed in 3-D with the naked eye. 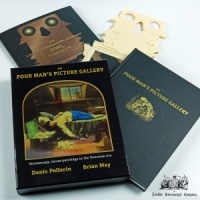 Inside is a classical matt-black, gold-lettered hardback book and a matching envelope containing a high-quality focussable ‘OWL’ stereoscope for viewing the pictures in 3-D. This particular special limited edition of the OWL is moulded in Freddie Mercury Wembley Stadium Yellow polypropylene! Brian May, founder member, songwriter and guitarist with the rock band Queen, and co-creator of the internationally successful rock theatrical, We Will Rock You, is also a Doctor of Astrophysics, a leading campaigner for animal rights, and a lifelong 3-D photography enthusiast. Most recently, he has become a successful publisher, dedicated to sharing his vast collection of Victorian stereo photographs with the world through the books released by the London Stereoscopic Company (a fond recreation of the highly successful company of the same name founded in 1854). Brian currently tours with Queen for much of the year with Adam Lambert as lead vocalist, as well as composing, recording and performing in collaboration with West End star Kerry Ellis, an original luminary of the cast of We Will Rock You. His many other recent projects include working on 3-D 360 degree virtual reality movies, and the much-anticipated biopic of Freddie Mercury, which commences filming in September this year. Brian lives in London with his wife, his partner for over thirty years, actress Anita Dobson. Few people can say they’ve toured with Queen! This book makes you feel like you’ve lived with the band! From those early, hairier, student days to rock arenas and worldwide adulation... Brian tells the stories alongside each immortal image so well and with warmth and audible fondness and has created the effect of the reader being there at those crucial moments. 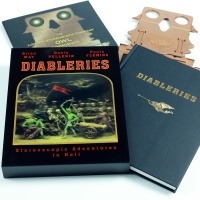 This book has deepened my initial curiosity in stereoscopy and I am now hooked and await Diableries like a devil put aside for me by Beelezebub!